Called "Mad Max meets Lord of the Rings" and "Harry Potter meets Die Hard", this multi-award finalist series is a first-person, high-action adventure that grabs you by the collar at the start and doesn't relent. If you're looking for a fun popcorn adventure with a classic tough-guy type, this is it. Absolutely! (and I already have!) This is the kind of storytelling experience that can get new listeners hooked on audiobooks. This story was just SO addicting. The serialized format reminds me a binge-watching a Netflix tv show, because I just couldn't stop. Every episode ended on a cliff-hanger. It was so entertaining with the right mix of humor and action. How do I chose one? Honestly I love how the first season ended (no spoilers here), because it left me dying to read season two and see what happened next. Re-reading this story as an audiobook was an amazing experience. The narrator absolutely nailed the voice of the protagonist. He did not simply read the book out loud, but rather put on a passionate, expressive performance. I was completely engaged the entire time I was listening to this book. This is the kind of storytelling that can get new listeners hooked on the audiobook experience. 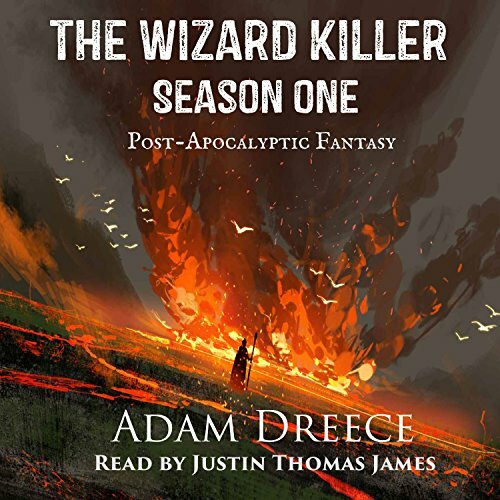 I would highly recommend the audiobook version of this entertaining post-apocalyptic story. I received the audiobook version from the author. I had previously purchased a physical copy of this fantastic serial. This was an awesome audio book experience. The narrator was fantastic. The serialized segments of the story actually worked for me. I enjoyed the overall story and really enjoyed the main character and the apocalyptic world he wakes up in. I would definitely look for more from this duo. This book is compared to such great things like Mad Max, Diehard, and Stephen King's Gunslinger, and even Harry Potter and The Lord of The Rings. With some things, I agree, with some things not. What's this book about? About an alone man who lost his memory, time and equipment. He woke up in unknowing place. So, he just goes with knowing where to move, seeks for food and possibility to recall anything from that period that he has lost, and kills everything on his path. Through him, we are acquainting with a post-apocalyptic world where everything died, and what's didn't die that became monsters and tries to eat something. Carns, ghouls, lichs, witches, wizards (I hope wrote them right) - any kind of monsters are here. Everything except &quot;common human&quot;. During his journey he recalls some fragments from his past, finds allies and weapon. Does it sound boring to you? If yes, keep reading, because this book DEFINITELY deserves attention. Why, you may wonder? Because the whole story is written very well. Because the main character is alive. No, I don't mean that he's alive because he walks-speaks-kills other creatures and so bearded pretty guy with this deep-and-sensitive world inside. He's a MAN. Travelling with him through the ruined world you can't miss this man. He reminds me The Witcher from the beginning, the story with Adda. He has his doubts, but also he knows what's right. He is ready to accept something different from black-and-white, but he kills anything that tries bit him without any hesitation. He has his principles: to stay alive and make a revenge. While you're with him in that gloomy world you'll yell with him: wotta yig is going on?! Here we can compare this book with Mad Max because of the really mad world outside. Diehard and Gunslinger? Well, why not? If you're waiting for an exciting journey in the dark world filled with cruel creatures and dark secrets, and fast dynamic, and continuous stress, then it's a good choice for you. Unexpected Journey! A special word goes to Justin James. His work amazing! Beautiful deep voice and emotional narration made this book even more exciting. As outlined in the introduction, this 'season 1' collects 20-odd pieces, all released week to week. Ranging from 5 minutes to 15 minutes they have been collects and polish to remove any contradictions, to tell an ongoing story. The Wizard Killer wakes up with a sword in his chest - clearly he was dead - but has no memory of how, or even who he is. He starts travelling trying to work out what is going on, and where he came from, while avoiding monsters and other dangers of the world. Magic is 'failing' and thus unreliable, meaning his magical abilities are hit and miss, and magics affect on the world is too. Generally the story is well told. It is first person, present tense, which works very well for the amnesia of the main character. Each short piece has a cliff hanger of sorts, with some being more tense than others. Had I been reading this week to week in the original release I'm not sure they would be enough to keep me coming back each week. But once combined here the story works well. Combined together the constant cliff hanger events with small pieces between make the story feel relentless. This does lessen as the story moves on and the pieces start to become more 10 - 15 minutes rather than 5 minutes. The extra time for the story in each piece helps. Narration by Justin James is good. Well paced and easy to listen to, he provides voices, emotions, inflections, pacing variations to match levels of excitement, etc. He definitely adds to the story through his narration work. This story was a bit confusing. I felt as if I should have read something else before this to fill in the missing information. Like I was reading book 2 before book 1. There were events and characters that you were expected to know about. I found myself drifting and not paying attention. The Narrator did a great job. He is the reason I finished the story. I was given a free review copy of this audiobook and I am leaving a voluntary review. Not my usual preference, and I'm not sure where I got exposed to it, but I certainly enjoyed it! Lots of action and without the usual recognizable cuss words. Being written in serial format makes it more affordable and easier for reading in travel or waiting areas. A good read! Justin James does a fine job! I have been wanting to start this series for a long time and when I saw this opportunity, I jumped for it. It didn't disappoint. It is a short book but it packed a punch. It outlined characters, world building, and more as it dove into the story. The main character wakes up from the dead, that's right..for the third time too...and we as readers get to experience how and what he remembers. We learn as he learns. We know he has magic, he is a wizard killer, and boy is he durable! He gets hurt a lot! LOL. It is a great fantasy read to introduce us to the series and I am glad I got started. The narrator could not have been better. Perfect voice and performance for the many characters that the wizard came in contact with (and the strange languages). Will Definitely Be Following This Series! Love the first season of The Wizard Killer although I get the feeling that the narrator was not actually fighting a monster in episode six. Video proof would be great so I could sleep better at night. In all honesty the narrator does an amazing job bringing the story to life. The authors story portrayed through the narrators smooth voice made this an easy listen and fantastic story that kept me wanting more. Will definitely be following this series for more from this author and narrator. I've read the book.Now I've listened to it. wasn't sure on the voice but after episode 1 I don't think any other voice would work as well. definitely well worth it. 10/10 would recommend. also good for when the family is with you. Let me start out by saying that I do hope to get the next season. However, there are some pretty big issues with this story. I was willing to give it some leeway because it’s a serialization, but it took me until the last half hour or the narrative to really get into it. I love post-apocalyptic stories almost as much as I love high fantasy. I was sure that the combination would be amazing. However, it wasn’t. We meet the main character in the middle of a wasteland, waking up after being stabbed, and he doesn’t remember who he is. This could have been a really interesting story of survival, like The Road. The problem was, I didn’t relate to the main character enough to care. The main character was not proactive at all. Everything happened to him, rather than him taking charge of his life. Even when he was fighting for his life, he was just a very reactive character. The learning curve was very steep. I was thrown into the world without a life jacket, or even floaties. If you would like some explanation to what’s going on, you really won’t get one. This upset me, mostly because I didn’t really understand the magic system until halfway through the story. Even then, I didn’t know what the limitations on the magic system were, aka what it could and couldn’t do. All this being said, I have nothing but good things to say about the narration. Justin James has the voice of an angel. It’s deep and rumbling and over all soothing. He made me care enough to keep going, when I otherwise would have put it down. The reading style wasn’t too slow or too fast, and his diction was on point. Over all fantastic job. I did get into it at the end, and like I said, I will get the next season. I hope our main character will be a little bit more proactive in that one.